NYC public school teachers who read these words might wonder on what planet the ACLU conducted this study. Just last year, Chancellor Dennis Walcott released a much more relaxed discipline code for the entire system. Even before this new code, one of the most common complaints from teachers in the city has been the complete lack of discipline in the schools. I served as a dean for the first few years of my career. Deans in NYC are essentially school disciplinarians. They handle suspensions, parental conferences, arrests and investigations of wrongdoing. One of the first things I learned as a dean was how to suspend as few kids as possible. Kids who got into fights, disrupted class, cursed out teachers or compiled a long list of minor infractions over time rarely saw suspensions. If teachers in NYC tend to feel handcuffed when dealing with classroom discipline, that is because they are. As a dean, I considered suspension my trump card only to be used in the most serious circumstances. We tried to work on modifying the behavior of disruptive students through mediation, parental involvement and conduct sheets that had to be filled out by teachers. At the time, I considered this a decent “ladder of referral”, as it is called in NYC. A combination of these things, along with a healthy relationship with the students, usually worked in quelling disruptive behavior. This allowed us to reserve our suspensions for the worst transgressions. I felt that using the suspension card too much cheapened its value and made it less effective in the long run. Of course, this disciplinary tactic opened us deans up to accusations by our colleagues that we were coddling unruly students. The way I saw it, suspension was a poor disciplinary tool. It essentially amounted to a three-day vacation for students. What happens when the kid comes back from suspension only to continue with their unruly behavior? Since public schools cannot expel kids, the only thing left to do was to suspend them again. The only exception to this is in the case of the “superintendent’s suspension”, as it is called in NYC. A superintendent suspension is usually given in response to a serious infraction, like a major fight or brandishing a weapon or assaulting a teacher. In my salad days as a dean, a “supe’s suspension” entailed getting a parent to pick the kid up from school on the day of the infraction. Then I would tell them to wait for the superintendent’s office to hand down a hearing date. Once the hearing date was set, we had to determine what type of penalty we wished to seek. The penalties ranged from a long suspension to a request for transfer to another school. We then had to go to a hearing where the student, parent and possibly their lawyer had a chance to defend themselves against the accusations being made. In most cases, the parents did not show up and we were able to get the penalty we wanted. Very few infractions rise to the level of a superintendent’s suspension and fewer still warrant expulsion. In the most extreme case I saw as a dean, three students assaulted the principal which resulted in an all-out rumble between them and the School Safety officers. They were arrested and ended up testing positive for having crack in their system. Despite the egregiousness of this case, it was still a fight to get these kids out of our school. They lawyered up and dragged out the superintendent suspension hearing for weeks. In the end, the main reason why public schools do not usually seek to suspend kids is that it looks bad on the “data” that has become so ubiquitous under Bloomberg. Principals know that suspension rates are a matter of public record, and also get factored into the school’s annual report card grade, so they discourage deans from pursuing suspensions. This is why schools that routinely get rated as “safe” in NYC can be anything but. So the question remains: what planet did the ACLU study? Most teachers here would not recognize the zero tolerance suspension mills portrayed in this report. I searched the entire study for the word “charter” (as in charter school) and the word did not come up once. My suspicion is that the study lumped charter schools in with the rest of the public school system. In that case, I can imagine suspension rates going through the roof over the past decade. The zero tolerance, almost militaristic, discipline code of many charter schools is well documented. Despite the claims of many charter advocates that they are as public as any public school, their discipline, suspension and expulsion policies are of a totally different breed. In any event, the study does not paint an accurate picture of the discipline policies of NYC public schools. That is not to say that a school-to-prison pipeline of some sort does not exist here. It is just not the lock-em-up, zero tolerance type that exists in other places. The report mentions the fact that many public schools have metal detectors through which all students must pass every morning. This is true and is not a practice with which I agree. However, I think it is important to look at what happens on the other side of the metal detector. I know a very smart parent who enrolls her children in a charter school. Despite my protestations to her that charters are nothing but test-prep mills, she has a response with which I cannot argue: they do not tolerate unruly behavior. She does not have to worry about her child sitting in a classroom where kids are constantly disrupting the lesson. She does not have to worry about gang violence and fighting. While she might have an overly negative view of public schools, it is a view shared by many parents who opt for charters. These parents have a point. There really is little that a regular NYC public school can do to curb generally rowdy behavior. Principals do not want to suspend students. What is more, principals fear angering parents by coming down too hard on kids. They all too often turn a blind eye to unruly behavior for fear of hurting their “data” or having an uncomfortable confrontation with a parent. This blind eye amounts to a sanctioning of bad behavior. Kids are instinctively able to feel out where the limits of the adults lie. Many know that there are very few limits and take full advantage of this. This does not mean that most kids are unruly, far from it. However, it does not take a classroom full of unruly students to ruin the learning environment. A very small percentage of troubled kids can dominate a classroom or cafeteria. Through the sheer force of their examples and personalities, they can sweep up many of the meeker kids in a nefarious net where mischief becomes the order of the day. NYC’s teaching force is younger and more inexperienced than ever, as is the current crop of administrators. This means that the adults are less equipped to keep a lid on bad behavior. Experienced educators are able to manage school tone through soft means that do not include suspension or other types of harsh disciplinary actions. In short, lax discipline codes and inexperienced adults have been leading to a deterioration of school tone across the entire system. At the end of the day, this is another version of a school-to-prison pipeline. A good school is able to reward good behavior, recognize the role models in the student body and elevate them so their examples affect all of the other students. What we have is precisely the opposite state of affairs, one where the most aggressive and abrasive students become the role models and set the tone. Other students then learn the lesson that these are the qualities that get one ahead in life. In these cases, schools can become recruiting grounds for gangs and other types of dangerous activity. This is a school-to-prison pipeline that breeds criminality. Kids can be influenced into committing nefarious acts who might otherwise not be so inclined. They can be compelled to engage in a serious fight or drug use or brandishing of weapons or other types of criminal activity. These actions can lead to arrest and jail time. 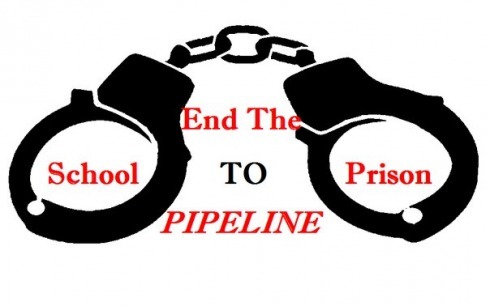 This type of school-to-prison pipeline is the other side of the same coin as the type of pipeline created by zero tolerance policies that criminalize even the most innocent childhood behaviors. A school can look for wrongdoing everywhere and end up criminalizing everything or it can look for wrongdoing nowhere and foster a culture of criminality. Charter schools fit the former category and public schools the latter. I respect the ACLU and what they tried to bring forth in this study. However, their treatment of the issue is too thick to be of much value. There are different types of school-to-prison pipelines and I hope one day groups like the ACLU can realize this for themselves. This entry was posted in An Embattled Career, education reform, School, teaching and tagged A B C D STPP, ACLU, ACLU School-to-Prison Pipeline, Charter School Discipline, NYC Department of Education Student Discipline Code, School, School Discipline Code, school to prison pipeline. Bookmark the permalink.